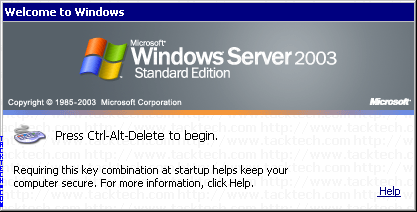 Disabled Control-Alt-Delete on Domain Controler [Ctrl+Alt+Del] (Windows 2003) - TACKtech Corp.
By default, you cannot disable CTRL+ALT+DEL on a Domain Controller running Windows Server 2003. Warning: Disabling this key combination causes your computer to be less secure. Select Domain Security Policy from Administrative Tools. Click on Security Settings > Security Options. Right-click on Interactive logon: Do not require CTRL+ALT+DEL in the right pane. Click Properties from the context menu. 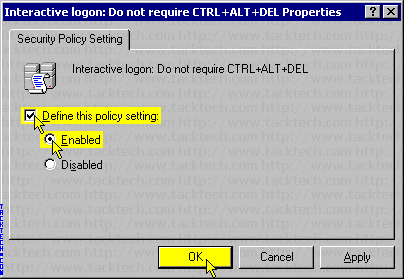 Check the Define this policy setting: checkbox. Close the Default Domain Security Settings window.